Betsalel Mobile Studio with Live Streaming Video specializes in Elegant Affairs. Video capture from 2 up 8 cameras Live Streaming*. We offer Crane /Jib 12 feet (Includes Crew of 2 People. Photography / Video Crew Men & Women. If you need SERVICE and QUALITY Betsalel is your only one choice. Get more for your wedding! 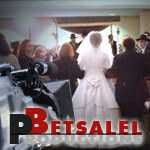 Don't forget to mention ChossonKallah.com when visiting Betsalel Productions.